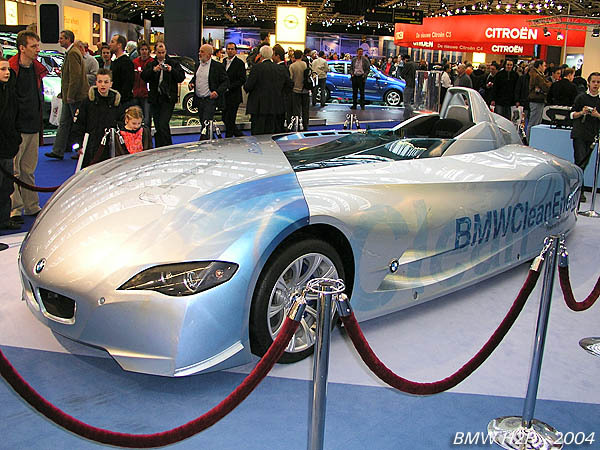 A very relevant concept, or rather experimental, car is this "Hydrogen Record Car" (H2R for short) constructed by BMW. For some decades now vehicle manufacturers have been researching alternatives for using fossil fuels as an energy source for engines. At first electricity seemed the way to go but the problem of practically storing sufficient amounts of electric energy proved too hard to solve. In recent years there was a distinct shift in attention to using hydrogen as an energy source. There's ample of it around (though most of it bound in water molecules), it's very combustable (remember the Hindenburg disaster? that was hydrogen burning) and it can be used environmentally friendly. 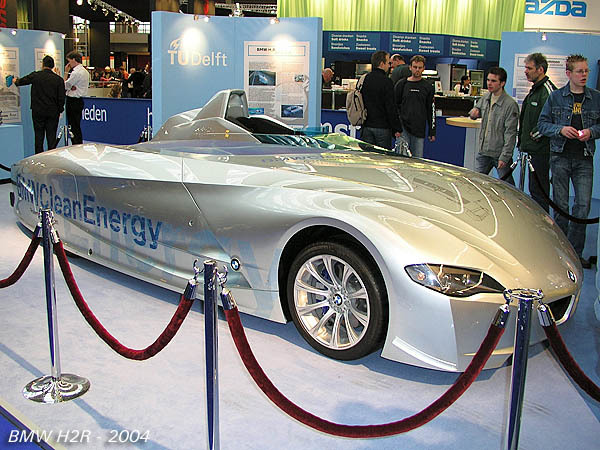 Most manufacturers are looking into fuel-cell technology as a means of utilizing hydrogen. This technology is based upon using the chemical reaction between hydrogen and oxygen to generate electricity which then powers electric motors. BMW however has chosen a more direct approach. They have adapted a regular, modern internal combustion engine to run on hydrogen. This sounds easy enough, but it has taken a lot of development work to make it run well. And to underline the results of this BMW has introduced the H2R in 2004 to set some record-breaking speeds for hydrogen fuelled cars. The H2R basically is a very streamlined lightweight racing car. It's based on an aluminum space frame monocoque construction and has a carbon fiber single-seater bodywork. In front of the car a 6-litre V12 engine is fitted which is derived from the production engine of the BMW 760 Li limousine. This massive engine produces 282 hp in hydrogen trim, enough to power the 1560 kg (at full load) H2R from 0 to 100 kph in 6 seconds and to a top speed of 302 kph. During September 2004 the H2R set 9 speed records at the French Miramas track, including fastest kilometer and mile times from a standing start (26.557 and 36.725 seconds respectively). Though this proves that hydrogen fuelled combustion engines can have ample performance the same engine in normal petrol trim would probably have done better. Never the less this is another stride forward in the development of hydrogen fuelled cars. 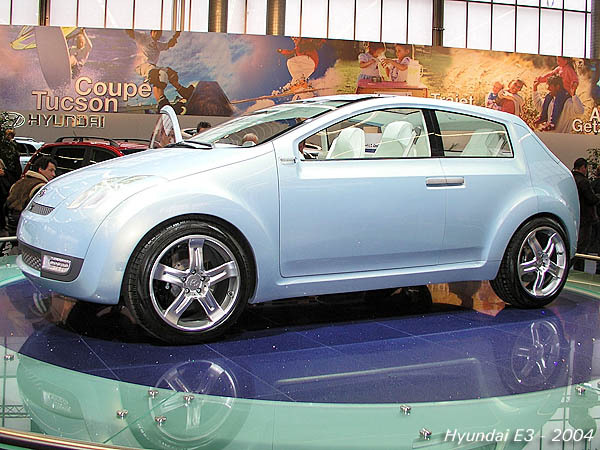 Less innovative is this Hyundai E3 concept which was unveiled at the Geneva Motorshow in 2004. Designed by Hyundai's German design studio it displays the styles and shapes which will feature on Hyundai production models in the near future. Its name refers to the three E's on which this design was based: Enjoyment, Environment and Extraordinary. Remarkable features are "suicide" doors which open wide to 90 degrees to offer a roomy access to the bright interior, an integrated bicycle carrier in the rear bumper and LED head- and rear lights. The interior features light pastel tints inspired by traditional Korean ceramics and this color scheme is also repeated in the engine bay. The E3 concept is powered by a 2.2-litre 4-cylinder direct injection diesel engine with double overhead camshafts, 4 valves per cylinder and a turbo, developing about 140 hp. 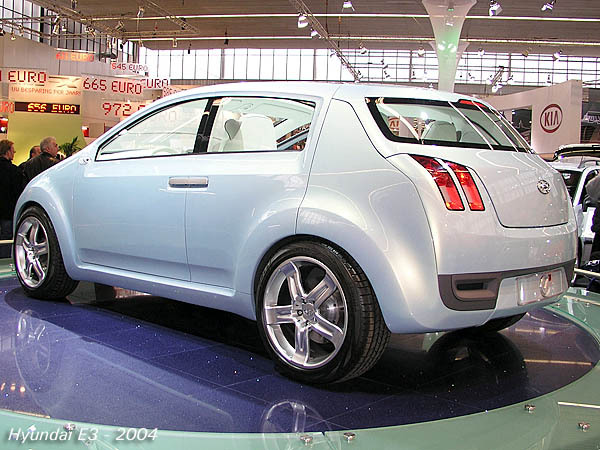 At about 4 meters length this concept fits into the European middle class range, a highly competitive sector of the car market with models like the Volkswagen Golf, Renault Megane and Ford Focus. It seems that Hyundai's European design studio has given especially the latest Megane and Focus models a good close look because design elements of these cars are found on this concept. Look for instance at the rear portion which recalls the distinctive rear side of the Megane and the extended wheel arches, a style which was first seen on the Focus. The E3 concept is a pleasing design which can be put on the market without much adjustments, but it isn't a trend setter or the "extraordinary" design which Hyundai wanted it to be. The Korean car manufacturer still has to look for its own styling vocabulary rather than citing that of others.